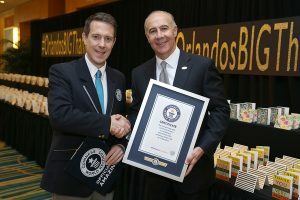 Global Travel Media » Blog Archive » Orlando Thanks Visitors in a Big Way for Making It No. 1 Destination in U.S.
Orlando Thanks Visitors in a Big Way for Making It No. 1 Destination in U.S.
“Orlando’s visitation number represents the emotional connections we make with millions all over the world. The love they show us never ceases to inspire us and led us to launch a year-long campaign around two important words: thank you,” said George Aguel, President and CEO of Visit Orlando. As a way to say thank you to Orlando visitors in 2016, the Orlando tourism community came together to handwrite 3,144 thank you cards for #OrlandosBIGThankYou. This new campaign will run through the remainder of the year to thank millions of guests for their support through hand-written cards, Visit Orlando’s social media channels, marketing communications, destination websites and member programs.